A guest post by London Historians Member, Jane Young. 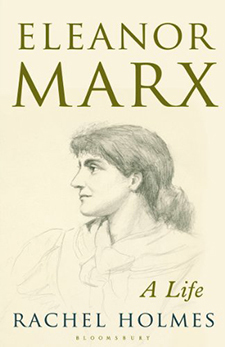 The first biography of Eleanor Marx (1855 – 1898) to be written in almost four decades, the 1972 -1976 two volume biography from Yvonne Knapp is a tough act to follow and Rachel Holmes has managed it with a flourish. Charting the progress of Eleanor Marx from right back to before her parents Jenny and Karl had even met; you are invited into the various and numerous homes of the Marx household. There you meet a ramshackle extended family in all its minutiae detail becoming familiar with everything from the furniture they sat on; the clothes they wore; the frequent visitors and the meals they ate. Filled with a wealth of anecdotes taken from journals and letters, this book builds an enchanting picture of a dynasty whose consistently limited housekeeping budget prioritises books, paper and ink as essentials. Within these pages the radical might of Karl Marx and Friedrich Engels become softened as the character of their inextricably linked lifelong relationship, a bond which ultimately fashioned the destiny of Eleanor herself is explained. Well known dignitaries within the circle of social reform: William Morris; Annie Besant; Clementina Black; Clara Collett; Israel Zangwill; George Bernard Shaw; Elizabeth Garrett Anderson; Beatrice Webb enter stage left. All human life is here, in an immensely readable well referenced format though Rachel Holmes successfully steers a course away from sentimentality through tragedy compounded by dark family secret. The feisty little girl who at the age of ten lists ‘Champagne’ as her idea of happiness and grows up to make her mark on history is revealed in the most engaging but down to earth narrative: encompassing the commonplace everyday details of friendships; failed relationships; bereavement; domesticity and the eternal problem of finding affordable accommodation in London. So much wider than a biography, moreover a graphic journey through Victorian London, Paris and Manchester. For all who have an interest in nineteenth century social reform, this account of a family that immediately endear themselves to the reader as ‘The Tussies’ is to be highly recommended. Eleanor Marx: A Life (525pp) by Rachel Holmes, 2014, is published by Bloomsbury with a cover price of £25, but is available for less.